Oh, I hope I don't get any berries on my feathers! This cardinal was eating little red berries out of the tree today and I happened to spy him through the window. This isn't selective color, but it looks like it. 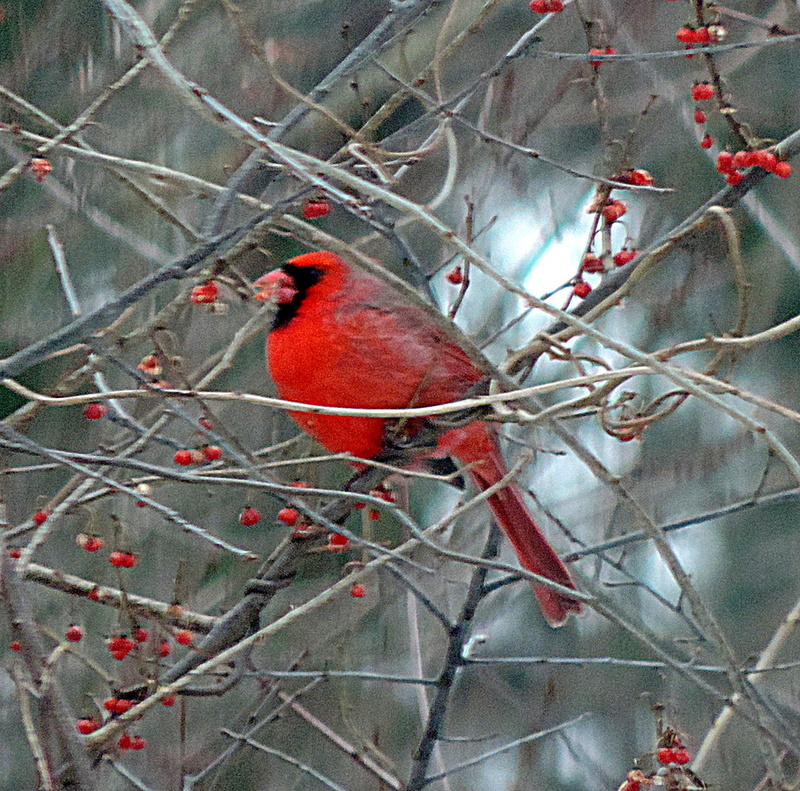 The cardinal and the berries were just bright spots on an otherwise gloomy day! Oh the color. Too late!! It stained him all red;-). Beautiful! Fun facts to know and tell - you aren't too far from the mark. Cardinals get their red from the food they eat. Oh I love cardinals, I wish we got them in the UK! Beautiful shot! It's the perfect setting! Lovely! The colors and details look great. This is a lovely composition, too! Lovely capture. I love all the pretty reds. @amandal @sturnus @elisasaeter @kathysview @tuya @paulam @mittens Thanks so much! @therubysusan I didn't realize that! LOL! I just know that I try to wear red if I'm eating Italian food, because I always get it all over me! LOL! Love this - great capture! Beautiful. He looks so brilliant. Those are some awesome colors. @linnypinny @chrissieh @digitalrn @jodibear58 Thanks so much! This is a fabulous shot with great colour contrast making the red stand out. Makes me remember my first sighting of a cardinal when I was visiting a friend on Cape Cod from the UK. We don't have such great coloured birds there and I fell in love with their zing! @ceilidh They are very beautiful. Our robins don't look a thing like your robins either. It's amazing how different birds can be. @homeschoolmom I can remember one of the early pictures I saw was of a flock of robins (it could have been yours) and sharing that you'd never see that with our robins. They are very aggressive and territorial. Yet we still love them as they follow us digging in our garden! @ceilidh Really? They are aggressive? They look so dainty! Ours are a little territorial, but there are always so many of them, it's hard to tell if they are a flock or just in large numbers. In this case (my collage), they were moving as a flock. Great capture Lisa! The red berries make it even better! I love how they stand out so well in winter- handsome fellow! I have a few of these fellows! Not always easy to capture! Good job! I am your get-pushed-84 partner! Here is my challenge - Find something local that gives the appearance of is older, a building, a statue, a car....and process it in sepia (or black in white) giving it the antique-like look! Enjoy!